I used to brag about how busy I was. I thrived on the stress of back to back appointments, being attached to my phone for calls and email, and working long after office hours were over. My busyness made me feel relevant, and productive. I enjoyed being in demand. At least that’s what I told myself. The reality is that I wasn’t happy being busy, even though I tried to convince myself and everyone around me I was. My busyness compromised my health, relationships, and overall sanity. Getting things done was the priority. If keeping up, catching up, and getting things done is your priority, where does enjoying your work, really being there for the people you love, and taking care of yourself fall? After making significant changes over the past few years, my schedule is rarely full. I have a busy day here and there, but I don’t have a busy life. Similar to Albert Einstein’s quote, “Out of clutter comes simplicity.” I’d like to suggest that out of busyness comes a deep desire for a more meaningful life, for a full life. Imagine a life with less confusion and doubt. Clarity makes everything easier, but getting there requires change and commitment especially if you are busy, distracted and overwhelmed. When you are clear about what makes you happy, healthy, and loving, you can be happy, healthy, and loving. When you are overextended, your brain becomes a running to do list that you chew on all night long. When you begin to let go of non-stop activity on the outside, you naturally release the non-stop activity on the inside. Then you can sleep. When you make time to really listen to people, you learn so much. If you are too busy, conversations are rushed, but when you have the time and space to be present and engaged, the lessons are endless. Everyone has something to offer you. I could work harder, produce more, and grow my business faster, but that didn’t work for me before. Now that work for myself, I choose more meaningful work, projects I’m crazy about, and connection that lasts. My friend Brian Gardner from No Sidebar and I talk more about that in this interview: The Intersection of Minimalism and Running a Successful Online Business. How can we truly bond if I won’t put my phone down? How can I hear what you are saying if my mind is somewhere else? Make cuts to make room for the most important people in your life. Never be too busy for them. When was the last time you went for a walk just for the joy of it? When you are busy, walking might mean turning the speed up on the treadmill, or simply getting from point a. to point b. A joy walk is different. A joy walk invites you to stretch your legs, open your heart, and notice things that speak to your soul. You produce creative sparks even when you are busy, but it’s hard to take them seriously. Who has time for crazy ideas in such a busy world? Those sparks become more and more prevalent and tangible when you slow down. And then, the possibilities are endless. I remember feeling so busy that I thought one more thing would be the last straw. Handling the unexpected is much easier with less. Give yourself more flexibility so you aren’t completely derailed by surprises and life’s little curve balls. When you aren’t so busy, you can be kind, and become a witness to kindness. You start to notice the little things like a smile, or a wave. You have time to consider how you respond, and how you treat people. 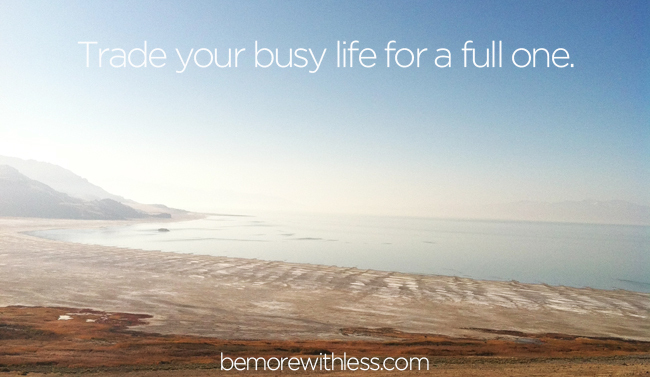 Trade your busy life for a full one. When you engage in passions and projects you love, and spend time with people you love, everything is sweeter. 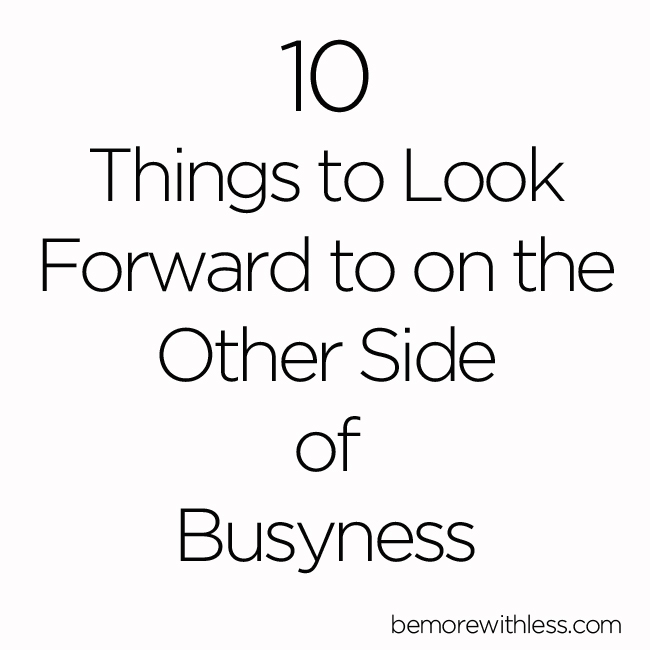 These 10 things to look forward to on the other side of busyness will be there when you are ready. Make room for them on your calendar and in your heart, one by one. I caught glimpses of them from my busy life, but today they are each a big part of my slower lifestyle. I may have missed opportunities in rejecting busyness, but I got my life back. Being busy is one of things that I actively work to avoid. Family and health come first, everything else is second. Courtney, busyness affects a lot of things in our lives. I am happy doing whatever comes my way. I find time for myself. I am happier when I am doing whatever relaxes me. I am retired, so that is easy. If I do not accomplish it today. I have no problem telling myself there is tomorrow. I’m so happy you got your life back, Courtney! Busyness just makes me sick, literally. I so much prefer the “full” life you describe and leaving busyness behind for more joy, creativity, and connection. Busyness can be really misleading and what’s worse, even appealing: you just feel like there’s always something new happening, so you assume you make a colossal progress, but oftentimes it turns out to be a huge waste of time. A schedule completely filled with various tasks is a waste of time if none of them matters. I realized that after ending up in the trap of busyness too many times. Last but not least, the new look of your courses page is perfect. It’s sleek, minimalist and professional – I’m sure it’ll have a great impact on potential customers. I look so forward to hearing your messages each day! Thank you so VERY much for caring and sharing! I have been searching for this “full” life, as you call it for a long time! I now have hope, because of you, that I will ! Thank you, Courtney! What a great reminder. I’m definitely in “busy” space right now as I’m working overtime at my day job and starting my own business…but the idea is to eventually work less than full-time 🙂 Or at least not more. Still maintaining a decent life-work balance overall, although I think the most important thing is that we take care of ourselves and feel happy and fulfilled. Thank you Courtney. I look forward to your emails. It’s my reminder that it’s ok to stop and breathe. You may feel you’re “trapped in a rut”, helpless, but the truth is there is slowness in busyness. Sure, there may be a lot of things you don’t like in your passion, but don’t think they’re a waste of time. Learning that you’re not happy with an endeavor is not wasted time. It only becomes such when you “accept your fate” and not fight for what truly matters to you, leaving you with the job you “hate”. Busyness can be a tool for knowing ourselves more. I try to make time to walk in the mornings. It’s so nice and relaxing to enjoy a bit of nature everyday (even if it’s just in my neighborhood). Plus getting a bit of exercise doesn’t hurt either! Indeed! Our culture exalts busyness, but I find it depleting in pretty much every possible way. How much lovelier to enjoy the few things rather than rush distractedly amongst the many. Thanks Courtney! Busyness is a real problem in my life. I think the end result is more important than the process to get there, especially if we’re just “spinning our wheels”. Sometimes I forget the difference between being busy and being productive. I look forward to these benefits as I become less busy. I was once the same way, where I wore busyness like it was a badge of honor. I’ve gotten to a wonderful place in my life where I make great efforts NOT to be busy, and I’m so much happier and less anxious as a result. I’ve found that I need a good balance of planned activities throughout the week but without crowding my schedule or filling every minute to be my happiest. This reads so much like me. Slaving 12 hours a day just to feel important, working on weekends just to catch up with all the responsibilities I couldn’t say ‘No’ to. When I found your blog several years ago and then joined Spark & Tinder, it was like a breath of fresh air, a feeling of peace and calm that I wanted to incorporate in my life. I made many changes to simplify my life, but now find myself working too hard on my side-business and becoming stresses, overwhelmed and losing focus. Interesting what you said about sleep. I sleep 6-7 hours a day but wake up exhausted because I know that my mind is working hard the whole night, running in circles about the million things I piled up on my plate. I’m going back to basics and re-reading your Zero to 100, GoodBlog course and How to create a Microbusiness that matters to soak up again that wisdom of taking time, being patient and mindful about business I’m building and how it fits in my life.